Frank Sinatra (December 12, 1915 – May 14, 1998) was an American singer, actor, and producer who was one of the most popular and influential musical artists of the 20th century. He is one of the best-selling music artists of all time, having sold more than 150 million records worldwide. Born in Hoboken, New Jersey, to Italian immigrants, he began his musical career in the swing era with Harry James and Tommy Dorsey. He found success as a solo artist after being signed by Columbia Records in 1943, becoming the idol of the “bobby soxers“. He released his first album, The Voice of Frank Sinatra, in 1946. By the 1950’s, Sinatra he became one of Las Vegas’ best known performers as part of the Rat Pack. His career was reenergized in 1953 with the success of From Here to Eternity and his subsequent Academy Award for Best Supporting Actor. He signed with Capitol Records and released several critically lauded albums, including In the Wee Small Hours (1955), Songs for Swingin’ Lovers! (1956), Come Fly with Me (1958), Only the Lonely (1958) and Nice ‘n’ Easy (1960). 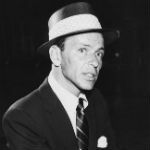 Sinatra left Capitol in 1960 to start his own record label, Reprise Records, and released a string of successful albums. In 1965 he recorded the retrospective September of My Years, starred in the Emmy-winning television special Frank Sinatra: A Man and His Music, and scored hits with “Strangers in the Night” and “My Way“. After releasing Sinatra at the Sands, recorded at the Sands Hotel and Casino in Vegas with frequent collaborator Count Basie in early 1966, the following year he recorded one of his most famous collaborations with Tom Jobim, the album Francis Albert Sinatra & Antonio Carlos Jobim. It was followed by 1968’s collaboration with Duke Ellington. Sinatra retired for the first time in 1971, but came out of retirement two years later and recorded several albums and resumed performing at Caesars Palace. In 1980 he scored a Top 40 hit with “New York, New York“. Using his Las Vegas shows as a home base, he toured both within the United States and internationally until a short time before his death in 1998.